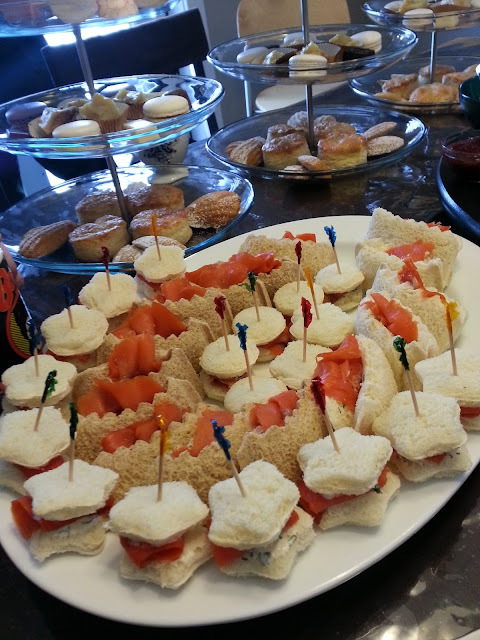 This post of part of the "An Afternoon Tea Gathering"
1. Mix the dill and yogurt together in a bowl. 2. You will need only about half to 1 slice of smoked salmon per slice of bread if you're making sandwich pockets; more if you're just cutting it for visual volume. 3 (a). If making sandwich pockets, spread some dill yogurt onto a slice of bread, taking care not to go to the edges, and use the sandwich shaper/cutter to press shapes. 3 (b). If making cutouts or just quartering the bread, cut first and then spread the dill yogurt. 4. Lay a slice of smoked salmon onto a piece of bread. You can make folds to create volume for visual appeal. If I remember correctly, these little sandwiches ran out first!